In Matthew 14 we find the story of when the disciples were caught in a storm on the Sea of Galilee. As nightfall approached, the waves rose higher and higher, continuing through the night. The boat was thrown every which way, leaving the disciples feeling helpless that the storm raging would surely take their lives.. They must have shouted prayers for Jesus to stop the storms, or to deliver them to the other side of the sea safely. Why wouldn’t Jesus hear them? Meanwhile, Jesus was on a mountaintop praying, far away from the disciples. He didn’t answer their prayers from there, far away and unseen. All night passed while the disciples’ boat crashed through the storm. Instead, as the sun rose the following morning, Jesus decided to met them out on the sea, walking on the water. Why? Why wait Lord, to deliver your people from their suffering? As Christians, we are not promised an easy life in return for our faith and obedience. The world is not promised a shield from pain and suffering simply because God exists. Suffering occurs, so why doesn’t God stop it? As we are in the boat, in the darkness and the storms, where is God? God is there. He has promised us that he will be with us through our trials and tribulations. Instead of making storms go away whenever they arise, He instead meets us in the middle of our storms, as he did with with His disciples. Jesus can calm any storm, and walk on water in the process! He has the power to save us from anything that befalls us. This has been a trying school year for our students and their families, and the devil is working hard to shake and divide us. In times like these, God is with us, and the storms will be calmed. Our job is to trust Him through it and wait to see the divine purpose from the pain. Throughout the month of January, we are asking our school community to join us in a “30 Days of Prayer” event. In times like these, a unified body in Christ, coming together in prayer, is a powerful response. 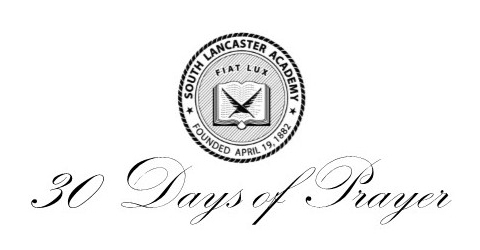 From Jan. 2 to Feb. 1, at 8 a.m. and 3:30 p.m. we ask each member of our school family to bow their heads in prayer to lift up South Lancaster Academy and ask for God’s blessing on our school. In addition, a school employee will be available in the lobby of each building at these times for a group prayer for those that can be present in person. The Bible tells us to remain joyful not because we know what happens next, but because we know the end. We will be stronger when we reach the other side. Each trial is an opportunity to step closer to complete and utter dependence and trust in God. Jesus is walking out to meet us!